Many individuals take advantage of e-signatures when it comes to signing their tax returns, and there are numerous benefits to doing so. For individuals who are still unsure about e-signatures, it’s important to know their legal validity as well as the advantages of using e-signatures to sign your tax returns. If you plan on filing your tax documents electronically, you must use an electronic signature. The signature comes in the form of a typed name as well as a five digit PIN (personal identification number). You will choose any PIN you want, so it’s simple to pick something you will remember easily. Most types of tax software will walk you through the process of choosing a PIN and signing your tax documents electronically. It’s important to know that an e-signature is just as legal and valid as a traditional signature, according to the Electronic Signature Act signed by former President Clinton in 2000. When your taxes are electronically filed, you will receive your return much faster than if you print, traditionally sign, and send your tax documents through the mail. In fact, most folks receive their returns within just a few weeks or less. 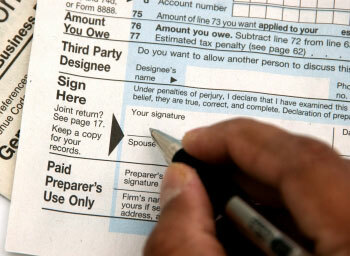 Those who send the physical tax documents in will often wait between several weeks and even a few months to receive their tax returns. If you have your tax return deposited to a bank account, you can receive it even faster. When using an e-signature to sign your tax documents, you shouldn’t worry about safety and security. Depending upon the tax software you use, you will benefit from different types of security. Other individuals won’t be able to access your tax documents unless they know the PIN you’ve chosen. Also, as the information is transmitted, most of the time it is encrypted so even if someone were able to get it, they wouldn’t be able to understand it. It’s important to make sure your tax filing software or platform uses encryption and high level security. In addition to receiving your tax returns back faster, there are other benefits to using an e-signature for your tax returns. Individuals who are environmentally conscious don’t have to worry about the wasted paper that comes along with printing copies for the IRS as well as personal files and records. It’s possible to file electronically and use an e-signature for free. Also, there is more security with an e-signature, because other individuals don’t have access to your PIN, whereas anyone could attempt to forge your signature on a physical document. Utilizing the benefits of e-signatures to sign your tax returns is a wise and smart decision, and something many individuals have been doing for several years now. From enhanced safety and security to faster returns, those who haven’t utilized e-signatures yet should consider it this year when filing their taxes.